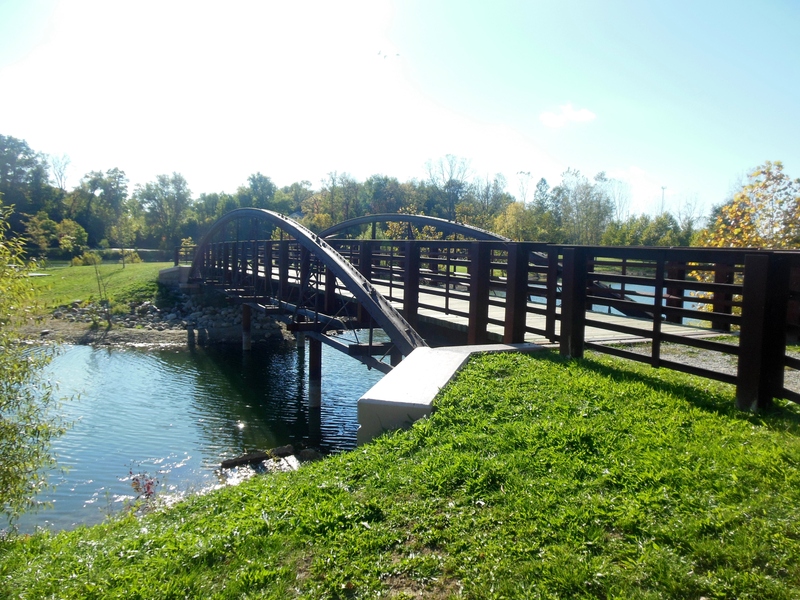 Billy Joel’s “River of Dreams” may have been deep, wide and hard to cross, but he might have finally found what he had been looking for in the shimmering “River of Glass” that I discovered in Mount Vernon. The River of Glass is one of the distinctive features of Ariel Foundation Park, located on the former site of Pittsburgh Plate Glass Works No. 11, one of the largest window-glass manufacturing facilities in the world. 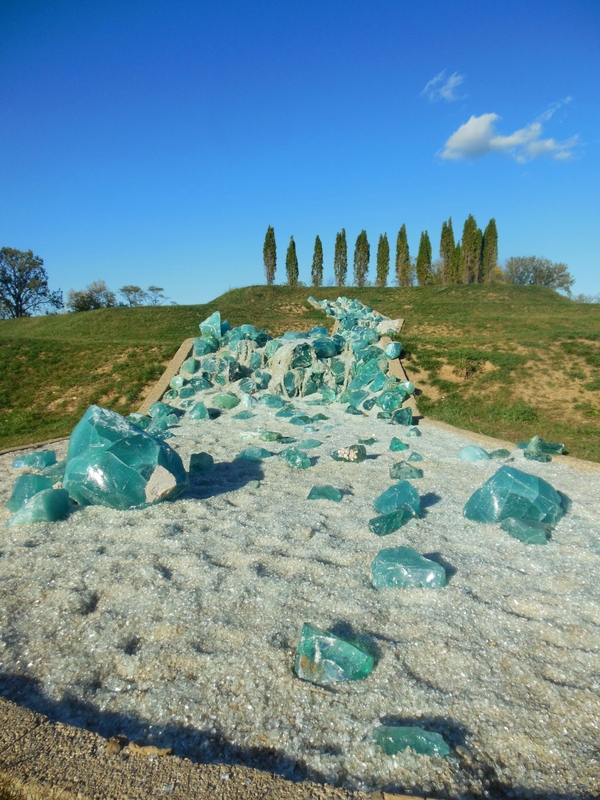 Crushed glass and chunks of glass, or cullets, cascade down a hillside, reminiscent of how continuous sheets of glass were drawn vertically from tanks of molten glass. The process was invented at this former PPG plant and was known as the PennVernon process. 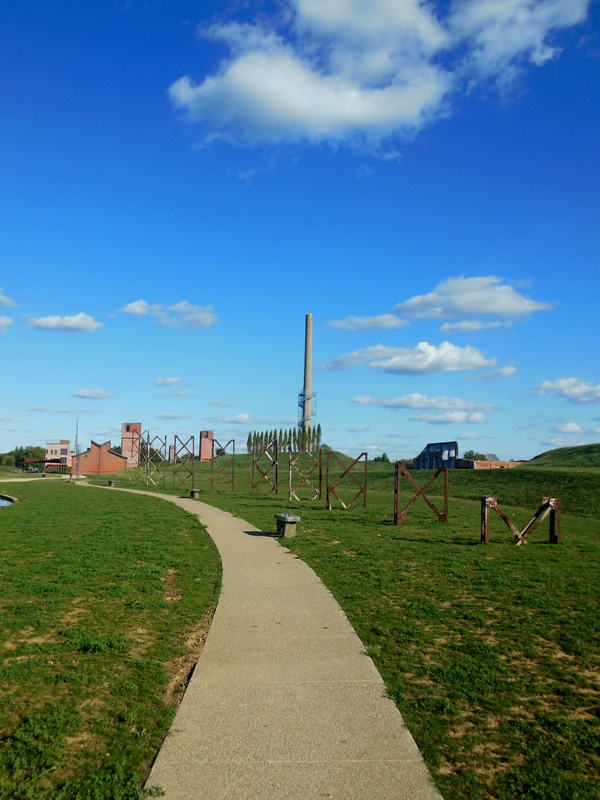 The park is a tribute to the site’s rich industrial heritage, first as the location of a steel-casting plant and then as the home for the PPG factory, which operated from 1908 to 1979.
and a 280-foot reinforced concrete smokestack. Whether you climb the 224 steps of the steel spiral staircase constructed around it to an observation deck 140 feet above ground or stop whenever terror takes over, you’ll be treated to a beautiful view of Mount Vernon. 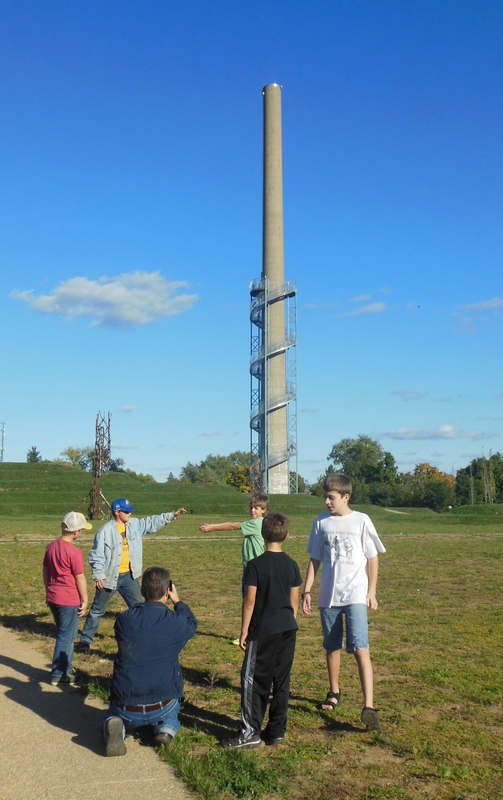 Viewing the smokestack from below can even inspire an impromptu lesson on perspective. 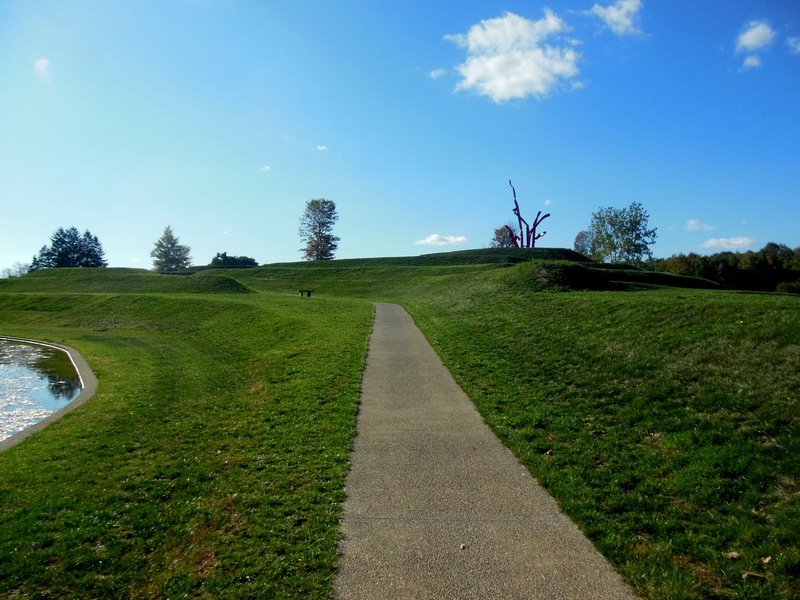 More picturesque views may be found on the spiral paths of The Terraces, inspired by the monumental works of landscape architect Charles Jencks. 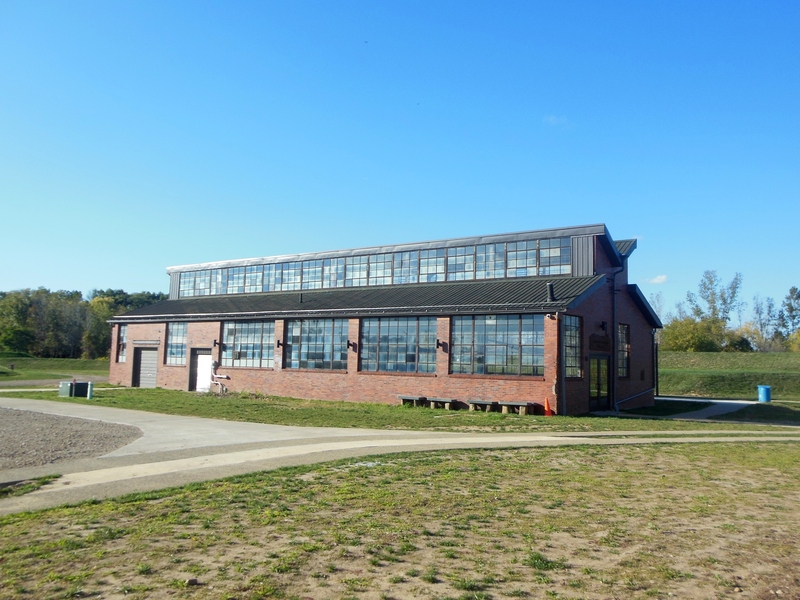 The PPG plant’s former carpenters’ shop, where wooden crates for transporting sheet glass were once made, is now the home of the Community Foundation Pavilion. The energy-efficient V-shaped roof of the circa-1945 structure continues to provide natural light and ventilation. The Cleveland, Akron & Columbus Railroad Depot, originally built in 1907, now serves as the park’s welcome center. The Ohio Erie Trail, running from Cleveland to Cincinnati on the old rail bed that once carried steam trains, passes nearby. A museum offers information about PPG that was provided through oral histories of former plant employees. Three large lakes, former gravel quarries, are surrounded by seven perfect picnicking pavilions. 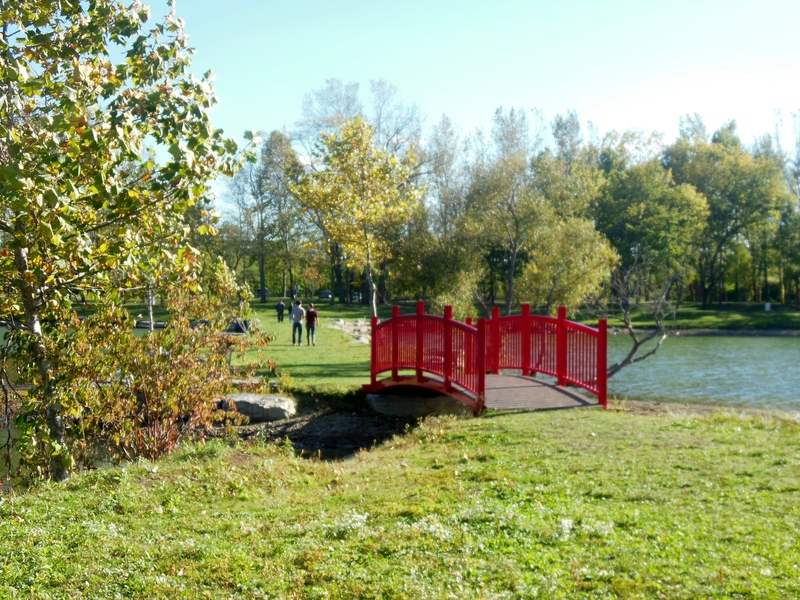 A cheerful red bridge and a narrow isthmus in one of the lakes lead to Mavis Island, dedicated to Mount Vernon Mayor Richard Mavis, who was instrumental in developing the park. A wooded area along the south side of the park’s lakes provides access to the Tree of Life Labyrinth, a 1,000-foot winding walkway that celebrates the virtues of faith, hope, charity and peace. Concerts are held in the park’s event center throughout the summer season. The park is open until November 15. For more, read Ariel Foundation Park, a book by Aaron J. Keirns that documents the creation of the park, the history of window-glass manufacturing and the history of PPG Works No. 11. 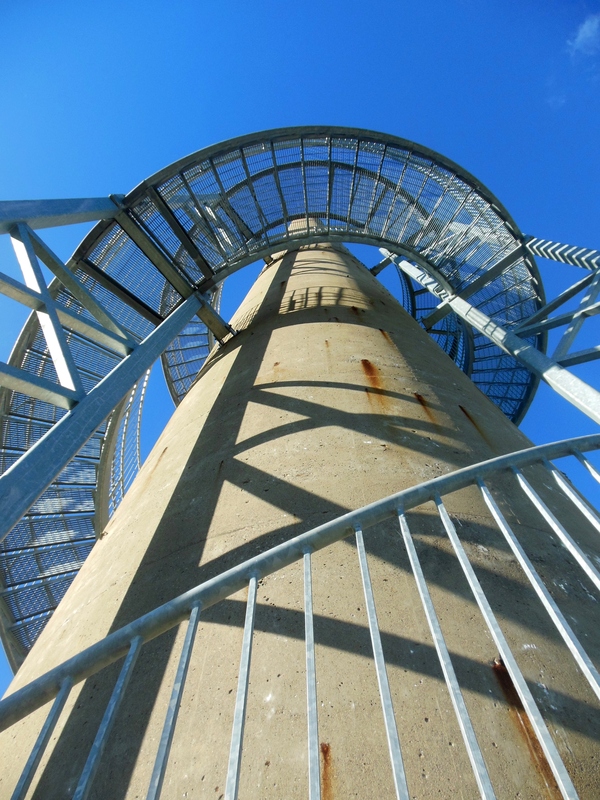 This entry was posted in Architecture, Art, History, Nature/Outdoors, Ohio. Bookmark the permalink.